"Archaeology Test" is a free online knowledge level test, about the basic subjects of Archaeology. This test include 18 fun questions from different archaeology fields of study, to determine an overall base level of archaeology competences. A small 18 steps interactive test for desktop computers, laptops and tablets, which may be solved online and recieve a school mark. The test is educational tools and include integrated evaluation system. It is cumulative with the Archaeology Tree Game. How to play Archaeology Test. The questions appear under the current round archaeology icon. Read them carefully and select one of three answers in white letters. Only one answer per question can be correct. Some questions have more than 1 correct answer and some questions are just for fun. Solving the test with a good school mark rewards +1 Knowledge Level. Here are the correct questions on YouTube. Class subject: Archaeology for Beginners. 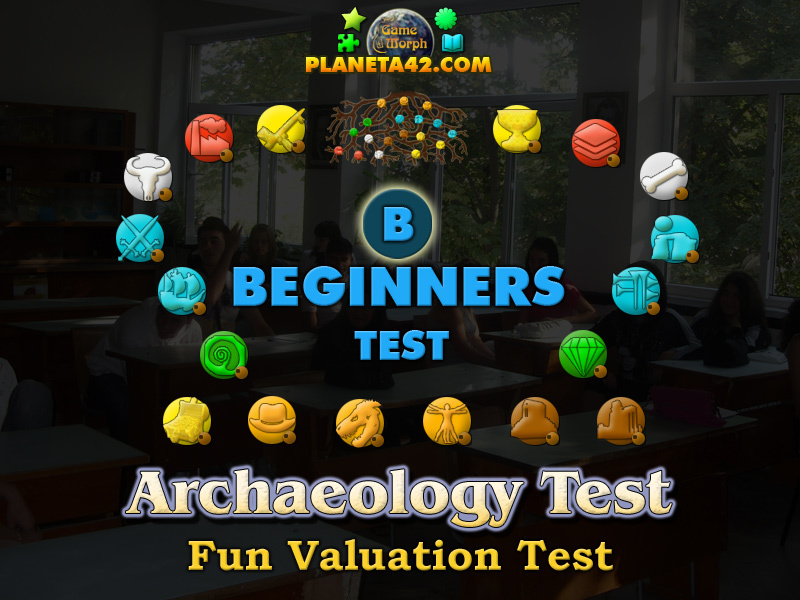 This test include one question from every 18 major branches of archaeology study, to determine an beginner's level of archaeological competences and give a school mark. Here are all the questions in the general archaeology test, with their possible answers. Solve the test online to see which answers are correct to recieve a school mark and new knowledge level. 1. Who is the archaeologist protagonist? 2. The science of excavating fossils prior Holocene is called? 3. The science of understanding humans is called? 4. How old is the first human settlement? 5. Where is tomb of Khufu located? - Great Pyramid of Giza. 6. Where is Thracian treasure found? 7. Object formed by humans, one of interest to archaeologists are called? 8. Artifacts, which have exceptional beauty, usage and historical value are called? 9. Which is one of the earliest systems of writing? 10. The astronomical configuration of ancient monuments is called? - 20 to 55 miles below the surface. - Places with low pressure. 15. Which is the era ruled by the dinosaurs? 16. Which is the era ruled by the fishes and marine species? 17. The branch of geology which studies rock layers is called? 18. Which is the era ruled by the mammals? Labels: Online Tests , Archaeology Tests , Online Tests , Free tests, Education Games , Free Online Games.